In the Budget of July 2015, the then-Chancellor announced that the current system of Vehicle Excise Duty (VED) would be overhauled for new cars registered from 1st April 2017. It’s important to note that these changes won’t affect vehicles registered before the 1st April 2017. The first year ‘licence rate’ will be set according to the vehicle’s carbon dioxide (CO2) emissions – on a scale ranging from £0 for zero-emission vehicles to £2,000 for those emitting over 255 gCO2/km. In every year after, all cars face a single rate of £140, except for zero-emission cars, which will not have to pay VED. There is also an extra £310-a-year charge on cars costing more than £40,000. This applies for the second to sixth years after registration, but disappears in the seventh. The new system has been developed to account for reductions in CO2 emissions. Under the existing system, no cars emitting under 100 gCO2/km pay any VED throughout their life. But, nowadays, more and more cars fall into this bracket. So, the Government would be at risk of losing out on important tax revenues. For instance, a car emitting 75 gCO2/km will have to pay £25 in its first year and £140-a-year thereafter. What will these tax revenues be spent on? The impact of these changes depends upon what vehicle you choose from April 2017. The new system has been designed to incentive the take-up of ultra-low emission vehicles – the lower the emissions the less you pay – with zero-emission vehicles VED free. 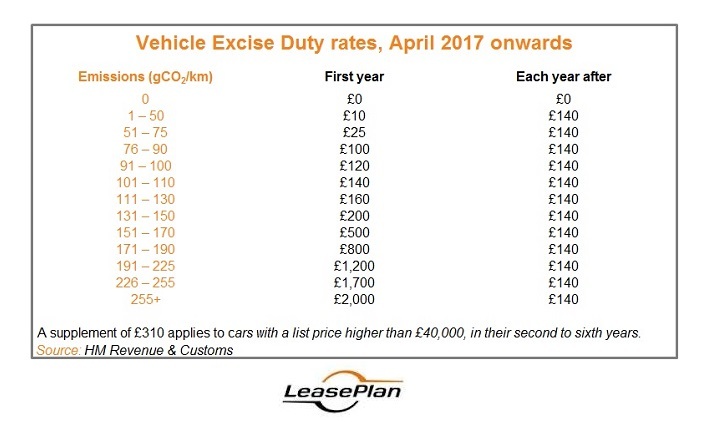 To reflect the new VED rates, LeasePlan updated its Quotes and Order systems on Friday 13th January to ensure that any new quotes produced from that date included the new VED rates. You can read more about this here. Visit the Gov.uk website for full details of the changes and how vehicles will be affected here.